It's getting increasingly hard to justify a smartwatch purchase when so many of them are launching with such high price tags. Paying $400 or $500 for a watch that works the same as one that costs half as much is a tough sell, not that a cheaper watch is an easy sell either. That's what makes the ZTE Quartz intriguing. This is an Android Wear device that costs less than $200 and has a dedicated cellular connection on T-Mobile. The Quartz is a bit large and clunky, and it's missing some of the features you get with more expensive watches. 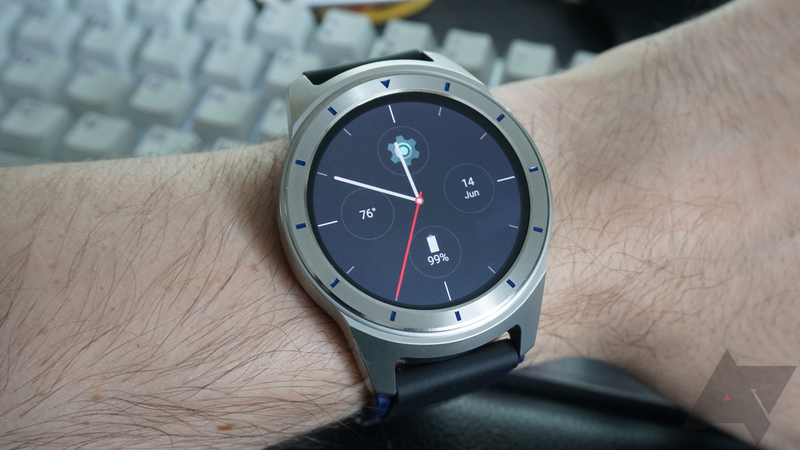 However, the design is solid considering the price, and it runs Android Wear just as well as more expensive watches. The cellular connectivity is an interesting bonus that coincides with important changes over at T-Mobile. This isn't the best smartwatch, but it might be the best deal on a smartwatch. Price Under $200 is a reasonable price for a smartwatch right now. Design Clean, understated design with standard 22mm lugs. The crown button is delightfully clicky. Display Fully round AMOLED with a high resolution. Speaker Surprisingly loud and clear for a watch. Cellular connectivity Plugs into your T-Mobile account for a dedicated cellular connection. Missing hardware No NFC, light sensor, or heart rate sensor. Design again The watch is a bit clunky because of the large size. No digital crown. T-Mobile Reps are still very confused by the Quartz's eSIM, so it's a pain to get activated. Can only be purchased from T-Mobile. Strap The stock rubber watch strap is cheap and doesn't lay flat on the wrist. I feel like a broken record here, but the ZTE Quartz is another big watch. Most smartwatches I've used lately are in this same size range of 45-46mm case diameter, which is the same as a large men's mechanical watch. It's 14.5mm thick, which is similar to the LG Watch Sport. This is mostly a consequence of having cellular connectivity (more on that later). There's a single crown button on the Quartz at the 2 o'clock position, and it's just a button. There's no digital crown functionality on this watch, which is a bummer. That said, the button is sturdy and has a nice tactile click when pressed. 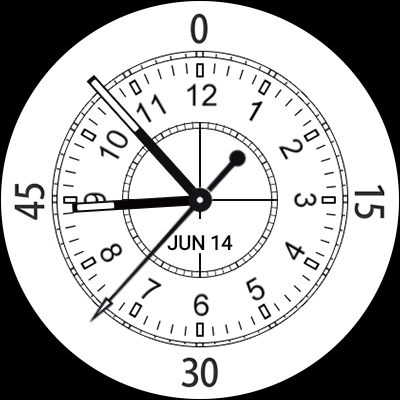 The bezel of the watch has tick marks on the hours around the face, which is a good middle ground between completely plain bezels and numbers. The Quartz bears a striking resemblance to the Samsung Gear S3 when you lay eyes on it, though the shape is a bit simpler and the bezel doesn't rotate (duh). 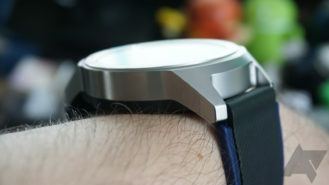 Most of this watch's frame is aluminum, but the underside is just black plastic with no heart rate sensor. Hey, gotta save cash someplace on a $192 smartwatch. This does at least keep the weight down—the Quartz is about 66g without the strap. That's a little more than devices like the ZenWatch 3 and Huawei Watch 2. A fully metal case would probably have put this watch into "too heavy" territory. The lugs extend outward and down from the body of the watch, which does help the fit somewhat on smaller wrists. On the top edge between the lugs is a speaker, which is rather large as watch speakers go. It's surprisingly loud and clear, too. ZTE didn't get fancy with the lug design, which is appreciated. These are standard 22mm lugs, so you can pick up any band you want as a replacement for the stock one. As for that stock band, I'm not a fan. It's a basic blue and black silicone design, which has a certain understated attractiveness. However, it bunches up oddly near the clasp, and there's only one loop to hold it in place. It would probably look nicer if there was a second loop to hold the excess band down. If you have larger wrists, the stock band might suit you just fine as there would be less of it to tamp down. 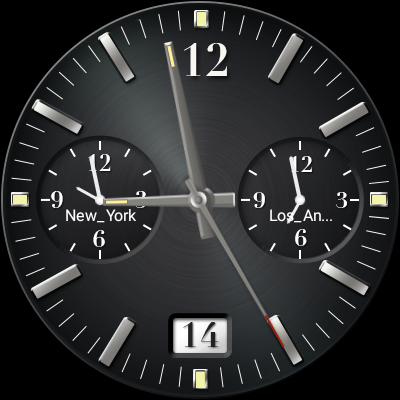 The Quartz has a 1.4-inch round AMOLED display with a resolution of 400x400. This panel is manufactured by EverDisplay, which looks acceptable in most lighting conditions. It's better than the screen on the $1,500 Tag Heuer watch, but not quite as good as the Watch Style. There's some unevenness in the colors, and it's especially obvious in the dark gray color Android Wear uses so much. Brightness is average, so the full active mode is legible in bright outdoor light if you turn it all the way up. However, you need to do that manually. In the interest of cost savings, there's no light sensor in this watch. 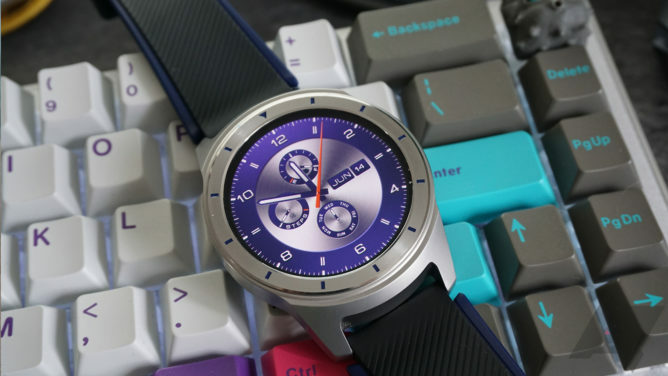 Smartwatches with cellular connectivity tend to be more expensive, but this one is not. There are a few concessions to make that happen, perhaps most notably the lack of LTE. 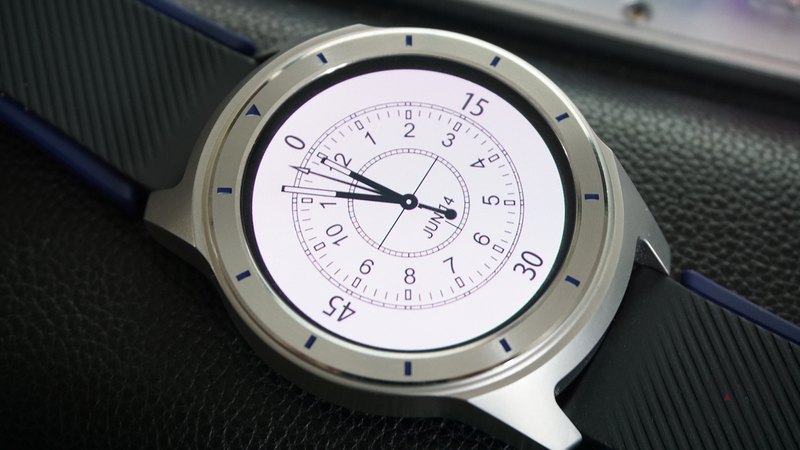 This watch connects to T-Mobile's network via 3G only. That's a real blast from the past, right? HSPA+ is obviously not as fast as LTE, but keep in mind this is a watch. It's never going to be responsive enough to take advantage of the speed advantage you get with LTE. Most smartwatches are getting their data over Bluetooth via your phone, after all. I've tested the 3G connection on this watch extensively (as a separate line, not DIGITS), and it's fine. 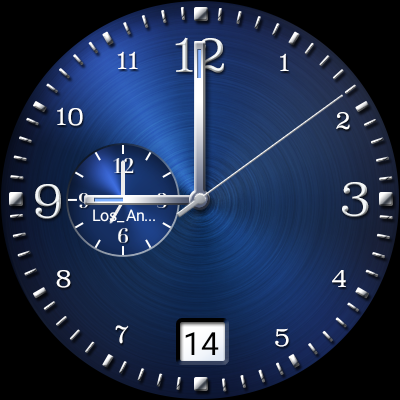 The watch doesn't feel any slower than it does on Bluetooth or WiFi. T-Mobile is pushing the Quartz as part of its DIGITS service, which is one of the reasons ZTE released the watch when it did. If you pick up the Quartz, you don't have to add a new line to use it on T-Mobile anymore. Simply hook it up to your existing number via DIGITS, and you can leave your phone at home. I don't know that I'd personally do that, but you can. Setting up DIGITS is, unfortunately, a pain right now. I should say, trying to set it up, because it's still not working. T-Mobile reps seem befuddled by the new number sharing features right now, especially with the Quartz as it has a non-removable eSIM. It took about an hour for a T-Mobile rep to figure out the situation with the Quartz. Apparently, T-Mobile's system is not yet able to register this watch on DIGITS, which is a bit odd considering the product page specifically mentions DIGITS functionality. You can set it up as a separate paid line, but I don't know why you would. I've reached out to ZTE, and they're working with T-Mobile to see what the deal is. I'll update when there's more information. The Quartz runs a Snapdragon 2100 like most other Android Wear devices these days, but it does get a more generous helping of RAM, 768MB of it. I don't know that it makes a real difference, but I've had no issues with the Quartz's performance. It's every bit as fast as the new Google/LG watches, which is to say it seems well-optimized for the hardware. Just to compare, the ZTE Quartz is noticeably faster at opening apps and has smoother scrolling than the $1,500 Tag Heuer watch. You could get seven ZTE watches for the cost of one Tag Heuer Connected Modular 45 and still have enough left over for a nice meal. Of course, no one would want to be seen with the guy wearing seven smartwatches. Table for one, then? Regarding battery life, keep in mind everyone's usage is different. I have three emails accounts syncing to the phone, and I regularly use it to control media playback and check messages, so I'd say I'm pretty hard on smartwatches. The Quartz packs a 500mAh battery, which is large for a watch. However, the cellular connection does eat into the battery a bit. In my testing, the Quartz paired with my phone easily makes it through a day with some juice to spare—somewhere around 30 hours of typical use for me. With the cellular connection active, you can shave four or five hours off of that. 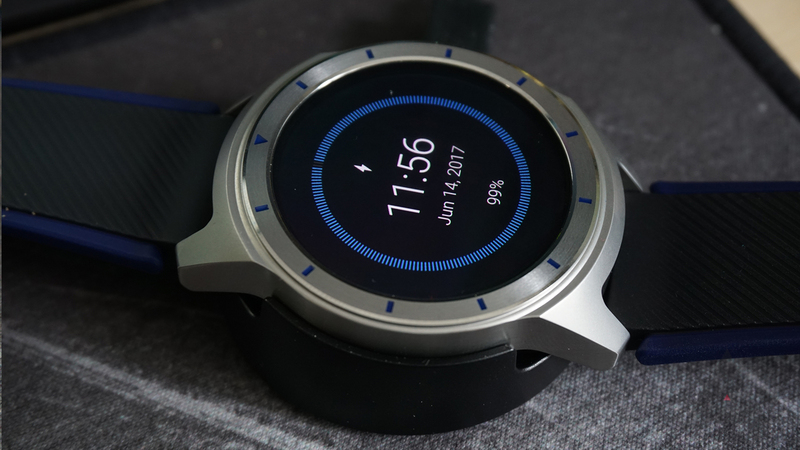 The battery life is above average for a smartwatch these days. Charging the Quartz has been a frustration for me. The watch comes with a plastic pogo pin dock that attaches magnetically to the bottom of the watch. 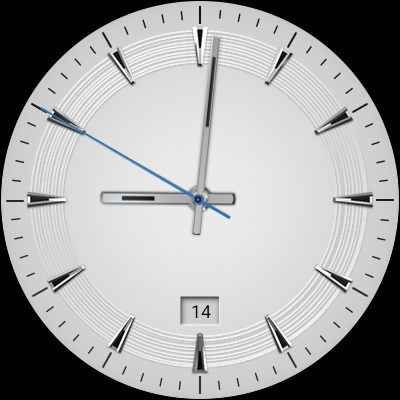 The shape of the dock ensures that the watch only fits in one way. This has all the elements necessary for a good charging experience, but it falls apart when actually using it. The dock seems to be too deep, so the watch sometimes gets slightly misaligned when you drop it in. As a result, it won't always make contact with the charging pins. 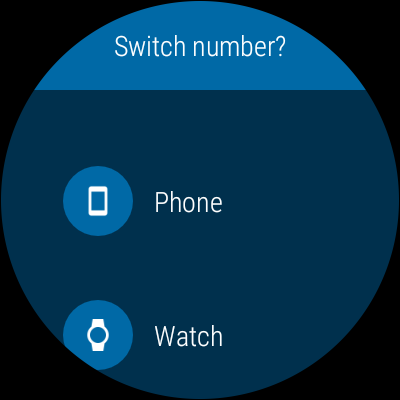 You might come back to a dead watch if you don't press it down and visually confirm that it's charging. 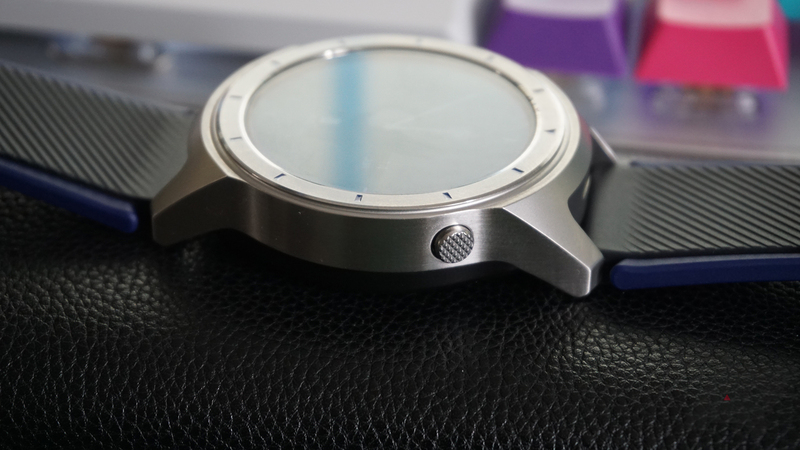 The ZTE Quartz is an Android Wear device, so there's not much in the way of customization. Perhaps the most notable thing about the Quartz is how bone-stock it is. 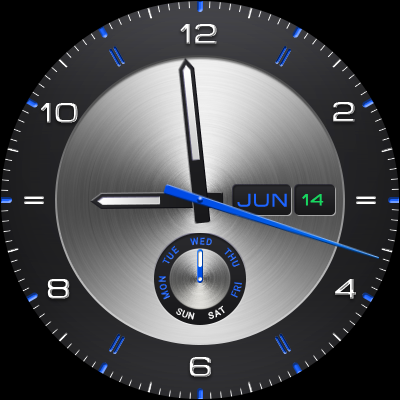 I mean, OEMs can't do much modification in Wear, but they at least include some apps and watch faces, but ZTE was hands-off. In the case of pre-loaded apps, I'm fine with that. That bloat is unnecessary most of the time. There's also no ZTE companion app for the phone, which is probably acceptable to most people. 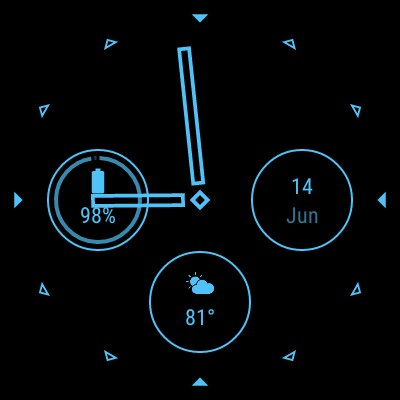 I would have liked to see more of an effort made when it comes to watch faces, though. 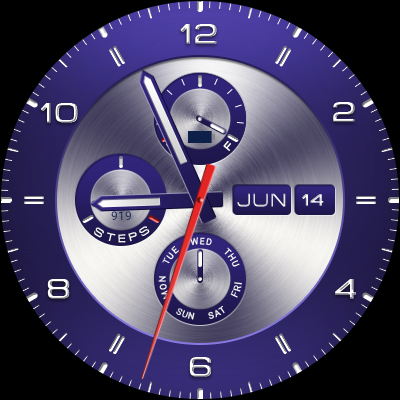 ZTE included ten watch faces with the Quartz, but several of them are essentially identical with different color combinations. 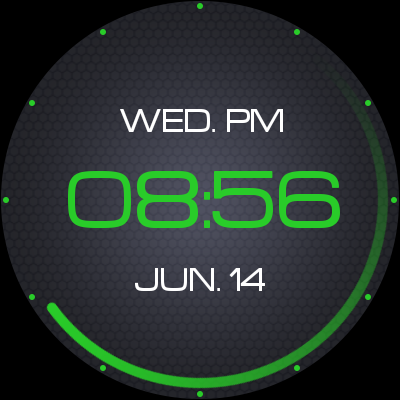 That could have been accomplished with a single watch face and some customization options. 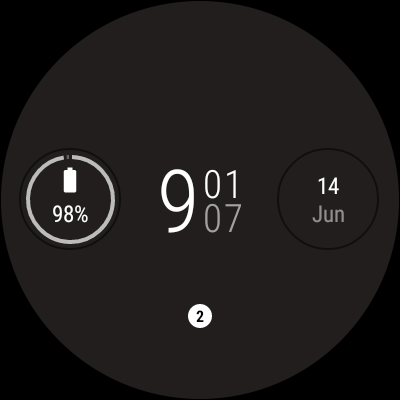 In general, customization is lacking in ZTE's watch faces. Some of them have no customization options, and most of the rest only have a few limited options. 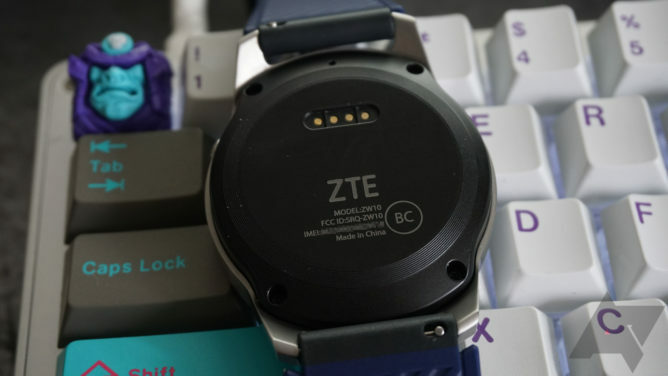 For example, the complications on the default "Basic" face are not the Wear 2.0 standard complications, but something much more limited built into ZTE's watch face. At the same time, there are a few solid faces with plenty of options like Elements and Concise. I continue to find notification handling in Android Wear 2.0 annoying. That's not ZTE's fault, but it's still an issue with this watch. In Wear 2.0, apps that use the bundling API actually have their notifications unbundled on the watch. So, each Gmail message gets its own screen. It takes much longer to scroll through your notifications if you have even a handful of unread emails. Wear 2.0 also disconnected the Watch's do-not-disturb mode from the phones. I find this change annoying, but I can see how it makes a little more sense in the case of the Quartz; this watch can actually be used as a standalone device. As long as you've got it connected to your T-Mobile account via DIGITS, you can use the SMS and phone apps on the watch all on their own. The Google Messages app actually lets you switch between the phone and watch number, if for some reason you have different numbers active on the devices. The phone app on the watch seem to always use the watch's cellular connection; even fiddling with the advanced connection settings does not change that. 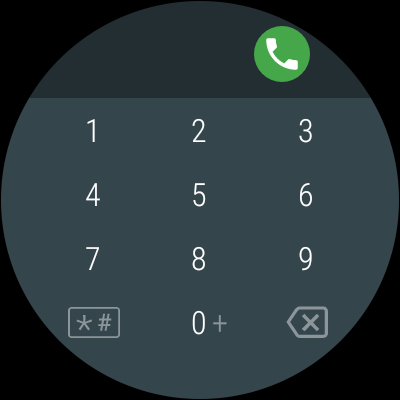 That means you can't start or control a call via your phone using the watch, which really should be an option. 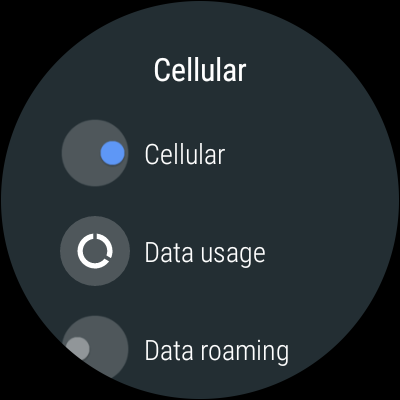 Even if you turn off the cellular connection, the Quartz doesn't handle calls on the phone over Bluetooth. It just tells you to turn off airplane mode, which is not even on. Clearly, Google still has some work to do with Wear's cellular functionality. This watch does not have the most features or the slickest design. In fact, the ZTE Quartz often falls into the "just fine" category. If this were a more expensive watch, I'd be irked about things like the lack of NFC and a digital crown. However, at less than $200 with cellular connectivity, it's hard to argue. Yes, that cell signal is HSPA+, but that hasn't caused any trouble for me. If that keeps the price down, I'm cool with it. I wish the Quartz was a little smaller, but the beefy battery and cellular connectivity take up space. It's toward the larger end of the watch spectrum, but no bigger than a large men's mechanical watch. There are a few pain points here, even with the low price. The charger has all the necessary elements to be good, but the watch doesn't quite align correctly unless you really smoosh it down there. 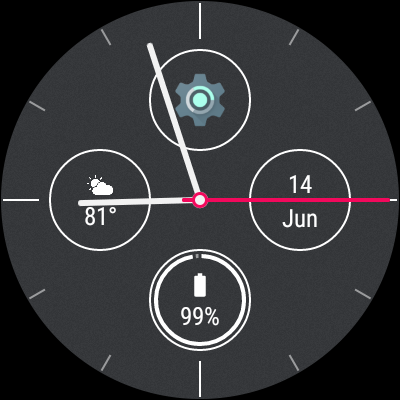 I've had a few instances where I thought it was docked, but came back later to a dead wearable. 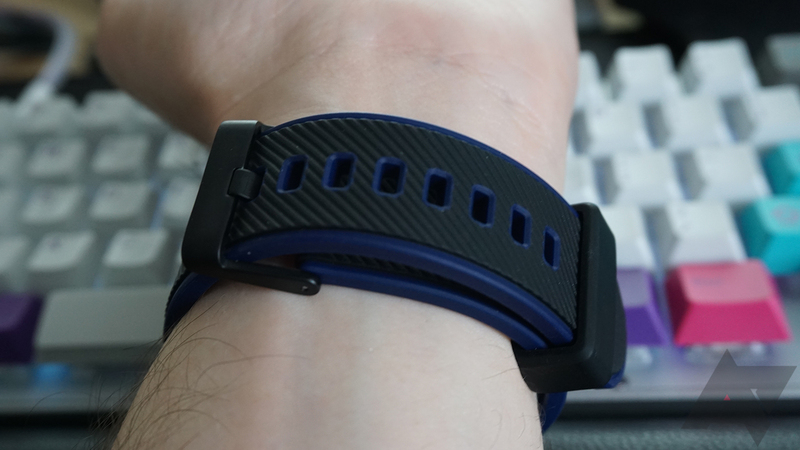 The stock band is also not my favorite as it's made a particularly inflexible rubber that doesn't lay flat when you're wearing it. On the plus side, the Quartz uses standard 22m lugs. If you're on T-Mobile and are looking to pick up your first smartwatch, the Quartz makes a lot of sense. It's cheap, and you can get it on your plan at no additional monthly cost (eventually). If you don't absolutely need something like NFC or a heart rate sensor, the Quartz gets the job done. I just hope T-Mobile figures out activation soon.